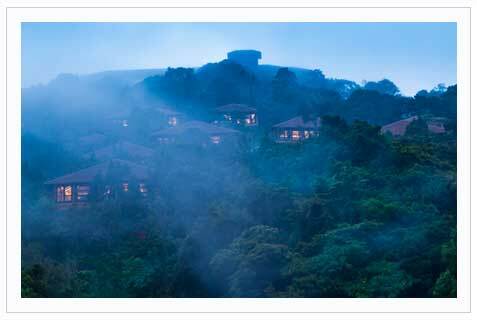 Vivanta by Taj – Madikeri, is quite simply a journey of lost and found. It invites you to travel to the bosom of a 180 acre living rainforest and unravel surprise after surprise in the most delightful style. Lose yourself in an expansive space which sits within a vibrant hill range at an altitude 4000 ft. Find a new high many times over. Explore some of the most amazing experiences which have been lost over time. Find the glory of nature at her luxurious best here. In the hills and forests with over 250 species of flora, the canopied woods, the natural spring, and among the many creature comfort delights that Vivanta by Taj helps you soak in. Find the most eco-friendly design and material which make nature and luxury co-exist in the 63 cottages, suites, villas and rooms. Don’t lose sight of nature at her best while you find how muted colours, mud paints, displaced soil and re-cycled wood, tiles and natural riverstones contribute to a seamless and undisturbed layout. One which is built around trees and not the other way round. Where no rock was displaced or hill cut, but instead built and evolved on the natural lay of the land as it has existed forever. It showcases the quintessential Coorg landscape - a rainforest canopy covering rolling hills and undulating greens breaking the monotony. Find yourself in the midst of a living and breathing rainforest at different levels of the valley offering expansive views of the landscape. Tariff is Inclusive of bed & breakfast only. Meal credit of Rs. 5000/- per couple. Usage of pool and other facilities.